The Islamic State of Iraq and al-Sham (ISIS) has achieved the goals of its major year-long offensive with the fall of Mosul and the collapse of the Iraqi Security Forces north of Baghdad. ISW assessed in October 2013 that ISIS sought control of terrain, particularly in Ninewa; that Mosul is the prize within the province; and that ISIS’s goal was to fragment the Iraqi Security Forces (ISF) starting from Mosul. ISW also predicted that Ba‘athist group Jaysh Rijal al-Tariqah al-Naqshabandia (JRTN) would cooperate in wresting Mosul from government control. 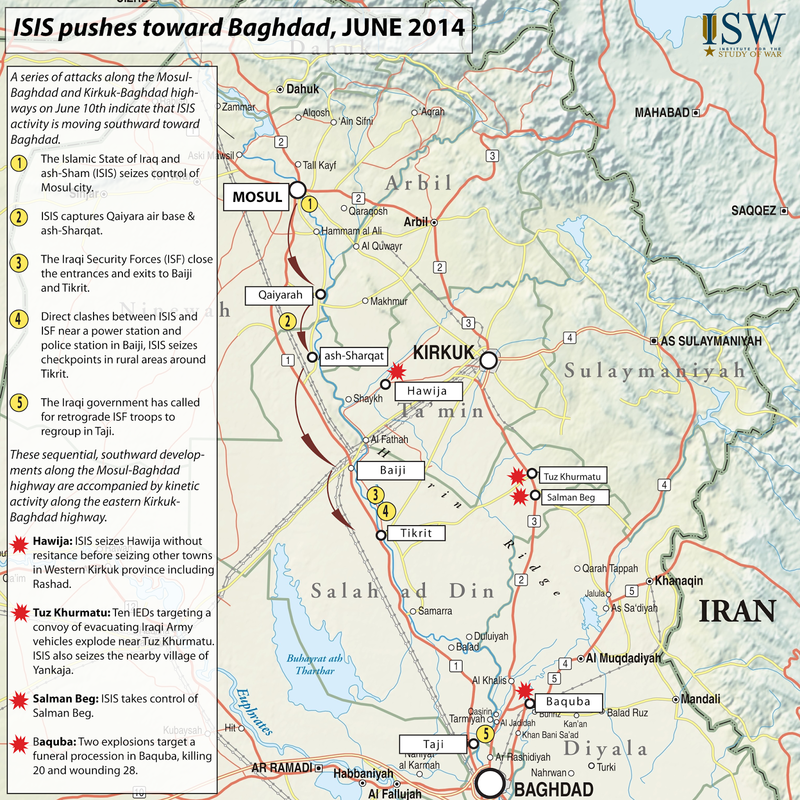 Enemy groups are moving south toward Baghdad on June 10, 2014. ISIS and JRTN have been heading southward toward Baghdad, following the roads south from Mosul to Taji and from Kirkuk to Baghdad. These groups have set conditions for a Baghdad offensive since January. The Islamic State of Iraq and al-Sham (ISIS) in Northern Iraq has conducted extraordinary, well-designed, rapid military operations that have gotten them from Mosul to Baiji in four days. ISIS launchedan attack upon Mosul, Iraq’s second largest city, from June 6-9, ultimately seizing the city as the security forces dissolved without staging major resistance. ISIS reportedly freed some 3,000 prisoners in Mosul and overran key military installations once housing U.S. Forces, including Mosul International Airport and Camp Ghazlani. This is the most significant inflection we have seen in Iraq since 2008, and it is a harbinger for Iraq’s future. The Iraqi Ministry of Defense delivered instructions on June 10, 2014 for retreating Iraqi Security Forces to consolidate in Taji. Taji is a significant military installation, but it is also just north of Baghdad, which means that Prime Minister Nouri al-Maliki has effectively ceded northern Iraq in the face of ISIS’s northern campaign, which now extends south from Mosul. This is a serious concern as remaining ISF in Baiji and Tikrit, major cities in Salah ad-Din province, face off with ISIS. After the southern Ninewa town of Qayarra and Salah ad-Din province’s Sharqat fell to ISIS, one uncorroborated social media report indicated that a police headquarters in Baiji also fell to ISIS on June 10, 2014. Additional reports indicate that checkpoints and outlying areas surrounding Tikrit have begun to fall to ISIS. The ISIS northern campaign is therefore proceeding systematically along a north-south avenue of advance toward Baghdad. A map of the offensive on June 10 can be found here. Where else is ISIS on the offensive? ISIS is also on the offensive elsewhere in northern Iraq. The complexity and simultaneity of the campaign indicate that the central ISIS military command has designed a major offensive to overwhelm Iraqi Security Forces by seizing control in multiple areas simultaneously. In addition to the southern advance from Mosul, ISIS has also launched offensives to take control of cities in Kirkuk province. These cities include Hawija, Riyad, and Zab in western Kirkuk. Offensives to take these cities were possibly launched by the same ISIS military element responsible for the Mosul attacks. South of Mosul, the Zab area connecting Hawija to Sharqat has likely been a control zone for ISIS since October 2013, when ISIS began to conduct an intimidation campaign against ISF in the area. This military force falls along western avenues of approach for foreign fighters and resources across the Jazeera desert from northern Syria, as well as at a hub of domestic financial flows from Mosul and Baaji. ISIS military elements there have likely been gathering strength for nine months or more. ISIS launched further offensives to take control of towns in the vicinity of Tuz Khurmatu in eastern Salah ad-Din on June 10. ISIS reportedly took control of Siniyah in Baiji, Salman Beg, and other neighboring towns. The ISIS system in this vicinity extends south in two directions, one to Udhaim, just north of the Khalis corridor which is close to Baghdad, and one through the mountain pass behind Lake Hamrin in northern Diyala. This corridor extends through the Diyala River Valley and on to the provincial capital at Baquba. Baquba was the capital of the Islamic State of Iraq (ISI), ISIS’s predecessor, and former ISI Emir Abu Musab al-Zarqawi was killed in the town of Hib Hib southwest of Baquba in 2006..
ISIS intends to establish an Islamic state in Iraq and Syria. ISIS seeks to take control of Iraq’s northern provincial capitals in order to bring them into its Islamic state, which they announced in April 2013 had materialized in ar-Raqqa, Syria. In order to take control of these urban centers, ISIS has to drive the ISF out. ISIS has conducted its named offensive, Soldiers’ Harvest, since Ramadan a year ago in July of 2013. 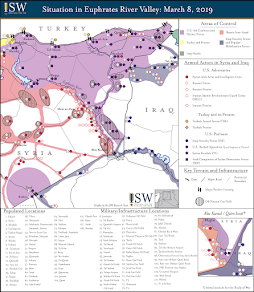 ISW assessed in October 2013 that ISIS’s Soldiers’ Harvest campaign aimed to give the organization control of terrain, particularly in Ninewa, to control Mosul as the prize within the province, and to fragment the ISF starting from Mosul. ISW also assessed that Ba‘athist group JRTN would cooperate in Mosul. ISIS has actively engaged ISF in each of the northern provinces over the course of the last year. ISIS has tested the ISF’s response, intimidated ISF through destruction of personal property and targeted assassination campaigns, and engaged in increasingly lethal attacks against security forces. The greatest take-away from the Mosul assault is that ISIS’s preparation of the battlefield has been sufficient to drive the ISF out of multiple cities in four regions in northern Iraq in two days. The ISF posture has also been affected by its units repositioning to Anbar since January of this year. This revives the question of whether ISIS seeks to take control of Baghdad. Maliki has ordered the dissolving ISF to consolidate in Taji, the main base outside of Baghdad. This is quite far south, and effectively cedes Tikrit and Samarra to the enemy. If the ISF regroups, it will do so behind the defensive line of the Samarra Operations Command. ISIS has multiple avenues of advance into Baghdad that are already behind this defensive line. In particular, it controls terrain in Garma, Abu Ghraib, and Tarmiya in the northern Baghdad belt, from which it can infiltrate Baghdad or challenge the ISF. ISIS has the potential to infiltrate Baghdad from the south or west, from control zones in Jurf al-Sakhar and Anbar respectively. If ISF seeks to surge forces from Baghdad in order to clear quadrants of the Baghdad belts and harden the line protecting Baghdad, it will face a difficult task of handling an enemy that has effectively encircled the capital. If Maliki draws forces from those locations to defend Baghdad, he will risk being defeated in detail. Why did ISIS attack Mosul now? ISIS attacked Mosul now because it could. A professional military organization launches an offensive when the conditions have been set. ISIS has set conditions for this operation for more than a year, has had the initiative for months, and has achieved offensive momentum throughout Iraq. In addition, with Ramadan just three weeks away, ISIS is likely looking to put a spectacular endpoint on the Soldier’s Harvest Campaign. Furthermore, the ISF’s attempted counteroffensives in Anbar and Babel have not been decisive, and have caused further attrition within the force. Finally, ISIS may have seized an opportunity, as ISF is also engaged in a heavy protection effort for the Shabaniya religious visit in Karbala this upcoming Saturday, June 14. The Ba‘athist Jaysh Rijal al-Tariqah al-Naqshabandia (JRTN) is also involved in the current anti-government campaign in northern Iraq. From a geographic standpoint, JRTN operates and is influential in areas where ISIS has launched its current northern campaign. JRTN has a well-established presence in Mosul city, Kirkuk province, and Salah ad-Din. Furthermore, JRTN has been more prominent in its anti-government insurgency as part of what is known as the Tribal Military Councils (TMCs) since the commencement of the Anbar crisis in January of this year. JRTN is capitalizing on the current environment to ensure that it is part of a “revolution” against the Iraqi government. JRTN has portrayed its role as active in the current campaign even though ISIS has taken the lead in launching anti-ISF operations and was the main force to take control of Mosul and the other fallen areas. For example, JRTN claimed in a statement that it played a major role in overtaking Mosul and “liberating” the five bridges that connect Mosul’s western and eastern parts. Furthermore, JRTN called in its statement for a wider uprising against the Iraqi government. Senior JRTN official, Khudair al-Murshdi, released a statement in which he lambasted Prime Minister Maliki for his calls to declare a state of emergency. Through its social media accounts, JRTN has also claimed responsibility for attacks in the same areas that ISIS is reported to have attacked the ISF. Notably, JRTN seeks to portray itself as only attacking the ISF and not civilians in order to ensure that it does not alienate the population. Moreover, JRTN has continued to portray its activities as part of a tribal anti-government uprising. This is likely intended to ensure a cover of legitimacy for JRTN and to remove any public appearance of JRTN’s Ba‘athist connection. JRTN’s military modus operandi with regards to ISIS has been either to take credit for ISIS major operations or to claim being part of them. This was evident when ISIS took over the Fallujah dam in January of this year. Tension between the two groups continued including May 31 clashes that took place in Salah ad-Din. 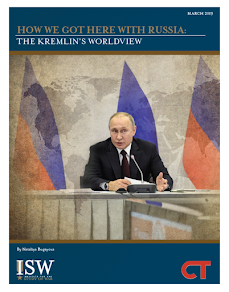 For now however, JRTN very likely assesses that the ISIS campaign as an opportunity to achieve concrete and symbolic gains and as a result will either tolerate ISIS dominance or be forced to accept it. What are the implications for Iraq and the region? Iraq’s territorial integrity is in question. The Iraqi Security Forces have fractured in the northern provinces. ISIS is putting military pressure on Kirkuk and the Kurdish region and may be trying to drive a permanent wedge between Kurdish and Arab Iraq. There is now an Islamic State controlled by an al-Qaeda splinter in the heart of the Middle East. The safe haven in ar-Raqqa, Syria is a training ground for foreign fighters, some of whom have returned to the west. ISIS will likely adopt Mosul as its capital. ISIS has areas of control and movement corridors from Northern Syria to the Kurdish regions, from there to Baghdad, and in Anbar. Iraq's security forces will not be able to retake all of the ground they have lost. They may not even be able to hold what they still have. The best-case scenario is a stalemate in which Iraqis manage to contain the ISIS state and army for now. The more likely case is the creation of another Syrian-style conflict pitting ISIS with increasing international support against desperate and increasingly brutal Iraqi Shi'a militias and ISF elements. The two civil wars, which have now completely merged, will continue to expand, destabilizing an already unstable Middle East and inviting further intervention by the Sunni Arab states and Iran. In the very worst case, the fall of Mosul could be a step down the path to outright regional war. It is likely to result in the meaningful creation of an al-Qaeda state straddling the Iraq-Syria border (and erasing that border), giving al-Qaeda a secure base of operations such as it has not had since the fall of the Taliban. Jessica Lewis is the Research Director at Institute for the Study War and Ahmed Aliis Senior Research Analyst and Iraq Team Lead at Institute for the Study of War.